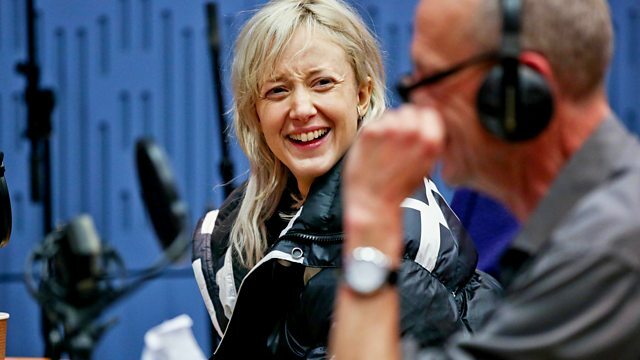 Clive Anderson and Arthur Smith are joined by Andrea Riseborough, Michael Connelly, Colin Morgan and Ariane Sherine for an eclectic mix of conversation, music and comedy. With music from Baxter Dury and Kojey Radical. 'Nancy' is in selected cinemas from 28th October and available on DVD on 5th November. 'Mandy' is in cinemas now. 'Talk Yourself Better' is published on 25th October. 'Dark Sacred Night' is published on 30th October. 'Waiting For You' is in cinemas now. ‘Prince of Tears’ and Baxter's collaboration album 'B.E.D' are both available now now on Heavenly Recordings. Baxter is performing at Plug, Sheffield on 6th, SWG3 TV, Glasgow on 7th and O2 Ritz, Manchester on 8th. Check his website for further dates. Double A-side release '97:Pure' is available now. Kojey is playing at The Caves, Edinburgh on 11th, Gorilla, Manchester on 14th and O2 Academy 2 and London's Koko on 20th November. Check his website for dates in between.